Honest Ed Mirvish passed away earlier today, and that's got me thinking about the man and what he meant to this city. His annual Christmas turkey giveaway is legendary and Mirvish Productions has brought a great deal of theatre to Toronto, but I'm going to focus on more personal memories of Ed. 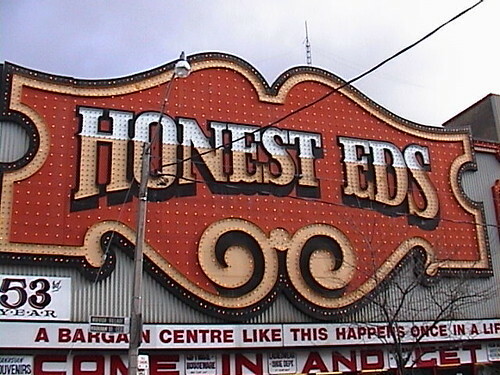 My mom often told me stories about going to Honest Eds with her mother. It was always a big event and these trips were highlights of my mom's childhood, as money was tight and bargains were to be had. My grandmother, who was born the same year as Ed, led these Honest Eds expeditions and she would glow when she spoke of Ed Mirvish. If there was a big event to celebrate, my grandmother would invite the entire family to Old Ed's Warehouse at King Street West and Duncan Street. Old Ed's Warehouse, in her opinion, was the place to go. It's since closed, but I have memories of getting dressed up to go to Old Ed's Warehouse for an English cut of roast beef, rolls, kosher dill pickles, mashed potatoes, Yorkshire pudding and canned peas, not exactly a kid's ideal meal. For years I attended a school near Bathurst and Bloor for one day a week. We'd take the subway to Bathurst and I'd see those lights and signs which always brought a smile to my face. I didn't personally shop at Honest Eds, but I liked knowing I could go there and score a 99¢ tee shirt if I needed one. Honest Ed was a Toronto institution who gave us Honest Ed's and Mirvish Productions, but I'll always remember him for the stories he gave my grandmother and mom. He will be missed. I remember as a kid going down to the city with my parents and Honest Ed's was always a regular stop. As you said there were deals to be had and my parents were (and are) forever frugal shoppers. I only ate ate Ed's Steakhouse (Wharehouse?) once, that's the one beside the theatre right? I was on a date with my then girlfriend (now wife)—we went to a show afterward—and all I remember was the tacky decor and the good food at a reasonable price. The man new the meaning of the word value and his contribution to Toronto's cultural community can not be overstated. You said it quite eloquently Mike. He never forgot his poorer days and those who struggled. His mom worked in his store when I was a child and that was well regarded. He said he came to Canada with a dollar in his pocket. His son will keep his name in the limelight. They were partners in the entertainment and art world . Of course his call to fame were the stars that frequented his restaurants. I remember as a child looking at all the pictures on his wall and dreaming. All my parents' festivites were celebrated either at Ed's Warehouse or Old Ed's, the slightly cheaper of the two. Farewell Ed Mirvish. You were quite a man. How will we celebrate the end of July this year? I just noticed that Mr.Mirvish passed away last year. I used to sell beef to Mr. Simpson at Ed's Warehouse. I knew Mr. Yale Simpson had passed away several years ago. Mr. Simpson was a very nice gentleman I remember. If so, hope the restaurant will be open some day. When I was an awkward teen a friend of the family took me to honest eds for the dinner of my life at the time. It was the beef room and we were at the 100 dollar a tip table I was so shocked. Then that was a lot of money! We had a waiter all to ourselves and the beef was the best I have tasted. I felt like Princess l o l ya so 80s! Honest ED has always been a part of my growing up,what a life he lived! A heart of GOLD,the turkey giveway was far far more than good advertising, the man truly loved our city,his city. God Bless him!